For the origin of life, see Abiogenesis, Astrobiology, and Panspermia. This article is about things that were once living. For other uses, see Lifeform (disambiguation). For longest lifespans, see List of longest-living organisms. Evidence of possibly the oldest forms of life on Earth have been found in hydrothermal vent precipitates. The earliest known life forms on Earth are putative fossilized microorganisms found in hydrothermal vent precipitates. The earliest time that life forms first appeared on Earth is unknown. They may have lived earlier than 3.77 billion years ago, possibly as early as 4.28 billion years ago, or nearly 4.5 billion years ago according to some; in any regards, not long after the oceans formed 4.41 billion years ago, and not long after the formation of the Earth 4.54 billion years ago. 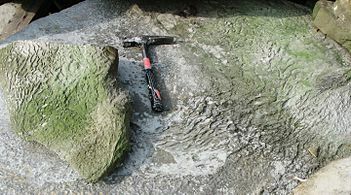 The earliest direct evidence of life on Earth are fossils of microorganisms permineralized in 3.465-billion-year-old Australian Apex chert rocks. A life form, or lifeform, is an entity or being that is living. Currently, Earth remains the only place in the universe known to harbor life forms. Archaea, prokaroytic microbes, were first found in extreme environments, such as hydrothermal vents. Some estimates on the number of Earth's current species of life forms range from 10 million to 14 million, of which about 1.2 million have been documented and over 86 percent have not yet been described. However, a May 2016 scientific report estimates that 1 trillion species are currently on Earth, with only one-thousandth of one percent described. The total number of DNA base pairs on Earth is estimated at 5.0 x 1037 with a weight of 50 billion tonnes. In comparison, the total mass of the biosphere has been estimated to be as much as 4 trillion tons of carbon. In July 2016, scientists reported identifying a set of 355 genes from the Last Universal Common Ancestor (LUCA) of all organisms living on Earth. The Earth's biosphere includes soil, hydrothermal vents, and rock up to 19 km (12 mi) or deeper underground, the deepest parts of the ocean, and at least 64 km (40 mi) high into the atmosphere. Under certain test conditions, life forms have been observed to thrive in the near-weightlessness of space and to survive in the vacuum of outer space. Life forms appear to thrive in the Mariana Trench, the deepest spot in the Earth's oceans, reaching a depth of 11,034 m (36,201 ft; 7 mi). Other researchers reported related studies that life forms thrive inside rocks up to 580 m (1,900 ft; 0.36 mi) below the sea floor under 2,590 m (8,500 ft; 1.61 mi) of ocean, off the coast of the northwestern United States, as well as 2,400 m (7,900 ft; 1.5 mi) beneath the seabed off Japan. In August 2014, scientists confirmed the existence of life forms living 800 m (2,600 ft; 0.50 mi) below the ice of Antarctica. According to one researcher, "You can find microbes everywhere — [they are] extremely adaptable to conditions, and survive wherever they are." Fossil evidence informs most studies of the origin of life. The age of the Earth is about 4.54 billion years; the earliest undisputed evidence of life on Earth dates from at least 3.5 billion years ago. There is evidence that life began much earlier. In 2017, fossilised microorganisms, or microfossils, were announced to have been discovered in hydrothermal vent precipitates in the Nuvvuagittuq Belt of Quebec, Canada that may be as old as 4.28 billion years old, the oldest record of life on Earth, suggesting "an almost instantaneous emergence of life" (in a geological time-scale sense), after ocean formation 4.41 billion years ago, and not long after the formation of the Earth 4.54 billion years ago. Nonetheless, life may have started even earlier, at nearly 4.5 billion years ago, as claimed by some researchers. Studies suggest that life on Earth may have come from biological matter carried by space dust or meteorites. "Remains of life" have been found in 4.1 billion-year-old rocks in Western Australia. Evidence of biogenic graphite, and possibly stromatolites, were discovered in 3.7 billion-year-old metasedimentary rocks in southwestern Greenland. In May 2017, evidence of life on land may have been found in 3.48 billion-year-old geyserite which is often found around hot springs and geysers, and other related mineral deposits, uncovered in the Pilbara Craton of Western Australia. This complements the November 2013 publication that microbial mat fossils had been found in 3.48 billion-year-old sandstone in Western Australia. In November 2017, a study by the University of Edinburgh suggested that life on Earth may have originated from biological particles carried by streams of space dust. A December 2017 report stated that 3.465-billion-year-old Australian Apex chert rocks once contained microorganisms, the earliest direct evidence of life on Earth. In January 2018, a study found that 4.5 billion-year-old meteorites found on Earth contained liquid water along with prebiotic complex organic substances that may be ingredients for life. According to biologist Stephen Blair Hedges, "If life arose relatively quickly on Earth … then it could be common in the universe." 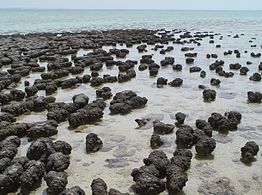 Stromatolites are made by microbes moving upward to avoid being smothered by sediment. 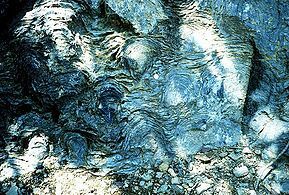 Stromatolites left behind by cyanobacteria are one of the oldest fossils of life on Earth. The cyanobacterial-algal mat, salty lake on the White Sea seaside. 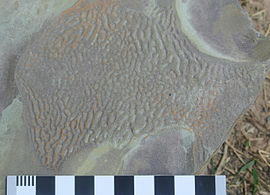 Wrinkled Kinneyia-type sedimentary structures formed beneath cohesive microbial mats in peritidal zones. Kinneyia-like structure in the Grimsby Formation (Silurian) exposed in Niagara Gorge, NY. ↑ 1.0 1.1 1.2 1.3 1.4 Dodd, Matthew S.; Papineau, Dominic; Grenne, Tor; slack, John F.; Rittner, Martin; Pirajno, Franco; O'Neil, Jonathan; Little, Crispin T. S. (2 March 2017). "Evidence for early life in Earth's oldest hydrothermal vent precipitates". Nature. 543. Bibcode:2017Natur.543...60D. doi:10.1038/nature21377. Archived from the original on 10 February 2017. Retrieved 2 March 2017. ↑ 2.0 2.1 2.2 Zimmer, Carl (1 March 2017). "Scientists Say Canadian Bacteria Fossils May Be Earth's Oldest". New York Times. Retrieved 2 March 2017. ↑ 3.0 3.1 Staff (20 August 2018). "A timescale for the origin and evolution of all of life on Earth". Phys.org. Retrieved 20 August 2018. ↑ 4.0 4.1 Betts, Holly C.; Putick, Mark N.; Clark, James W.; Williams, Tom A.; Donoghue, Philip C.J. ; Pisani, Davide (20 August 2018). "Integrated genomic and fossil evidence illuminates life's early evolution and eukaryote origin". Nature. doi:10.1038/s41559-018-0644-x. Retrieved 20 August 2018. ↑ 5.0 5.1 Ghosh, Pallab (1 March 2017). "Earliest evidence of life on Earth 'found". BBC News. Retrieved 2 March 2017. ↑ 6.0 6.1 Dunham, Will (1 March 2017). "Canadian bacteria-like fossils called oldest evidence of life". Reuters. Retrieved 1 March 2017. ↑ 7.0 7.1 Tyrell, Kelly April (18 December 2017). "Oldest fossils ever found show life on Earth began before 3.5 billion years ago". University of Wisconsin-Madison. Retrieved 18 December 2017. ↑ 8.0 8.1 Schopf, J. William; Kitajima, Kouki; Spicuzza, Michael J.; Kudryavtsev, Anatolly B.; Valley, John W. (2017). "SIMS analyses of the oldest known assemblage of microfossils document their taxon-correlated carbon isotope compositions". PNAS. Bibcode:2018PNAS..115...53S. doi:10.1073/pnas.1718063115. Retrieved 19 December 2017. ↑ "life form". World English Dictionary. Dictionary.com. 2009. ↑ "life form". Online Oxford Dictionary of English. Oxford University Press. 2005. ↑ Graham, Robert W. (February 1990). "Extraterrestrial Life in the Universe" (PDF) (NASA Technical Memorandum 102363). Lewis Research Center, Cleveland, Ohio: NASA. Retrieved 2 June 2015. ↑ Altermann, Wladyslaw (2009). "From Fossils to Astrobiology – A Roadmap to Fata Morgana?" (PDF). In Seckbach, Joseph; Walsh, Maud. From Fossils to Astrobiology: Records of Life on Earth and the Search for Extraterrestrial Biosignatures. Cellular Origin, Life in Extreme Habitats and Astrobiology. 12. Dordrecht, the Netherlands; London: Springer Science+Business Media. p. xvii. ISBN 978-1-4020-8836-0. LCCN 2008933212. Retrieved 5 June 2015. ↑ Novacek, Michael J. (8 November 2014). "Prehistory's Brilliant Future". New York Times. Retrieved 25 December 2014. ↑ G. Miller; Scott Spoolman (2012). Environmental Science - Biodiversity Is a Crucial Part of the Earth's Natural Capital. Cengage Learning. p. 62. ISBN 1-133-70787-4. Retrieved 27 December 2014. ↑ Mora, C.; Tittensor, D.P. ; Adl, S.; Simpson, A.G.; Worm, B. (23 August 2011). "How many species are there on Earth and in the ocean?". PLOS Biology. 9: e1001127. doi:10.1371/journal.pbio.1001127. PMC 3160336  . PMID 21886479. ↑ Nuwer, Rachel (18 July 2015). "Counting All the DNA on Earth". The New York Times. New York: The New York Times Company. ISSN 0362-4331. Retrieved 18 July 2015. ↑ "The Biosphere: Diversity of Life". Aspen Global Change Institute. Basalt, CO. Retrieved 19 July 2015. ↑ University of Georgia (25 August 1998). "First-Ever Scientific Estimate Of Total Bacteria On Earth Shows Far Greater Numbers Than Ever Known Before". Science Daily. Retrieved 10 November 2014. ↑ Hadhazy, Adam (12 January 2015). "Life Might Thrive a Dozen Miles Beneath Earth's Surface". Astrobiology Magazine. Retrieved 11 March 2017. ↑ Fox-Skelly, Jasmin (24 November 2015). "The Strange Beasts That Live In Solid Rock Deep Underground". BBC online. Retrieved 11 March 2017. ↑ Dvorsky, George (13 September 2017). "Alarming Study Indicates Why Certain Bacteria Are More Resistant to Drugs in Space". Gizmodo. Retrieved 14 September 2017. ↑ Caspermeyer, Joe (23 September 2007). "Space flight shown to alter ability of bacteria to cause disease". Arizona State University. Retrieved 14 September 2017. ↑ Dose, K.; Bieger-Dose, A.; Dillmann, R.; Gill, M.; Kerz, O.; Klein, A.; Meinert, H.; Nawroth, T.; Risi, S.; Stridde, C. (1995). "ERA-experiment "space biochemistry"". Advances in Space Research. 16 (8): 119–129. Bibcode:1995AdSpR..16..119D. doi:10.1016/0273-1177(95)00280-R. PMID 11542696. ↑ Vaisberg, Horneck G.; Eschweiler, U.; Reitz, G.; Wehner, J.; Willimek, R.; Strauch, K. (1995). "Biological responses to space: results of the experiment "Exobiological Unit" of ERA on EURECA I". Adv Space Res. 16 (8): 105–18. Bibcode:1995AdSpR..16..105V. doi:10.1016/0273-1177(95)00279-N. PMID 11542695. ↑ "Mariana Trench". Encyclopædia Britannica. Encyclopædia Britannica. ↑ 30.0 30.1 30.2 Choi, Charles Q. (17 March 2013). "Microbes Thrive in Deepest Spot on Earth". LiveScience. Retrieved 17 March 2013. ↑ Glud, Ronnie; Wenzhöfer, Frank; Middelboe, Mathias; Oguri, Kazumasa; Turnewitsch, Robert; Canfield, Donald E.; Kitazato, Hiroshi (17 March 2013). "High rates of microbial carbon turnover in sediments in the deepest oceanic trench on Earth". Nature Geoscience. 6 (4): 284–288. Bibcode:2013NatGe...6..284G. doi:10.1038/ngeo1773. Retrieved 17 March 2013. ↑ Oskin, Becky (14 March 2013). "Intraterrestrials: Life Thrives in Ocean Floor". LiveScience. Retrieved 17 March 2013. ↑ Morelle, Rebecca (15 December 2014). "Microbes discovered by deepest marine drill analysed". BBC News. Retrieved 15 December 2014. ↑ Fox, Douglas (20 August 2014). "Lakes under the ice: Antarctica's secret garden". Nature. 512 (7514): 244–246. Bibcode:2014Natur.512..244F. doi:10.1038/512244a. Retrieved 21 August 2014. ↑ Mack, Eric (20 August 2014). "Life Confirmed Under Antarctic Ice; Is Space Next?". Forbes. Retrieved 21 August 2014. ↑ "Age of the Earth". United States Geological Survey. 9 July 2007. Retrieved 2006-01-10. ↑ Dalrymple, G. Brent (2001). "The age of the Earth in the twentieth century: a problem (mostly) solved". Special Publications, Geological Society of London. 190 (1): 205–221. Bibcode:2001GSLSP.190..205D. doi:10.1144/GSL.SP.2001.190.01.14. ↑ Manhesa, Gérard; Allègre, Claude J.; Dupréa, Bernard; Hamelin, Bruno (May 1980). "Lead isotope study of basic-ultrabasic layered complexes: Speculations about the age of the earth and primitive mantle characteristics". Earth and Planetary Science Letters. Amsterdam, the Netherlands: Elsevier. 47 (3): 370–382. Bibcode:1980E&PSL..47..370M. doi:10.1016/0012-821X(80)90024-2. ISSN 0012-821X. ↑ Schopf, J. William; Kudryavtsev, Anatoliy B.; Czaja, Andrew D.; Tripathi, Abhishek B. (5 October 2007). "Evidence of Archean life: Stromatolites and microfossils". Precambrian Research. Amsterdam, the Netherlands: Elsevier. 158 (3–4): 141–155. Bibcode:2007PreR..158..141S. doi:10.1016/j.precamres.2007.04.009. ISSN 0301-9268. ↑ Schopf, J. William (29 June 2006). "Fossil evidence of Archaean life". Philosophical Transactions of the Royal Society B. London: Royal Society. 361 (1470): 869–885. doi:10.1098/rstb.2006.1834. ISSN 0962-8436. PMC 1578735  . PMID 16754604. ↑ Raven, Peter H.; Johnson, George B. (2002). Biology (6th ed.). Boston, MA: McGraw-Hill. p. 68. ISBN 0-07-112261-3. LCCN 2001030052. OCLC 45806501. ↑ 42.0 42.1 Berera, Arjun (6 November 2017). "Space dust collisions as a planetary escape mechanism". arXiv:1711.01895  . Bibcode:2017AsBio..17.1274B. doi:10.1089/ast.2017.1662. ↑ 44.0 44.1 Borenstein, Seth (19 October 2015). "Hints of life on what was thought to be desolate early Earth". Excite. Yonkers, NY: Mindspark Interactive Network. Associated Press. Retrieved 20 October 2015. ↑ Wade, Nicholas (31 August 2016). "World's Oldest Fossils Found in Greenland". New York Times. Retrieved 31 August 2016. ↑ Djokic, Tara; Van Kranendonk, Martin J.; Campbell, Kathleen A.; Walter, Malcolm R.; Ward, Colin R. (9 May 2017). "Earliest signs of life on land preserved in ca. 3.5 Ga hot spring deposits". Nature Communications. Bibcode:2017NatCo...815263D. doi:10.1038/ncomms15263. Retrieved 13 May 2017. ↑ Borenstein, Seth (13 November 2013). "Oldest fossil found: Meet your microbial mom". Excite. Yonkers, NY: Mindspark Interactive Network. Associated Press. Retrieved 2 June 2015. ↑ Pearlman, Jonathan (13 November 2013). "'Oldest signs of life on Earth found'". The Daily Telegraph. London: Telegraph Media Group. Retrieved 2014-12-15. ↑ Noffke, Nora; Christian, Daniel; Wacey, David; Hazen, Robert M. (16 November 2013). "Microbially Induced Sedimentary Structures Recording an Ancient Ecosystem in the ca. 3.48 Billion-Year-Old Dresser Formation, Pilbara, Western Australia". Astrobiology. New Rochelle, NY: Mary Ann Liebert, Inc. 13 (12): 1103–1124. Bibcode:2013AsBio..13.1103N. doi:10.1089/ast.2013.1030. ISSN 1531-1074. PMC 3870916  . PMID 24205812. ↑ "Space dust may transport life between worlds". University of Edinburgh. 20 November 2017. Retrieved 28 November 2017. ↑ Staff, Lawrence Berkeley National laboratory (10 January 2018). "Ingredients for life revealed in meteorites that fell to Earth - Study, based in part at Berkeley Lab, also suggests dwarf planet in asteroid belt may be a source of rich organic matter". AAAS-Eureka Alert. Retrieved 11 January 2018. ↑ Johnston, Ian (2 October 2017). "Life first emerged in 'warm little ponds' almost as old as the Earth itself - Charles Darwin's famous idea backed by new scientific study". The Independent. Retrieved 2 October 2017. ↑ Porada H.; Ghergut J.; Bouougri El H. (2008). "Kinneyia-Type Wrinkle Structures—Critical Review And Model Of Formation". PALAIOS. 23 (2): 65–77. doi:10.2110/palo.2006.p06-095r. This article uses material from Earliest known life forms on Wikipedia (view authors). License under CC BY-SA 3.0. This page was last edited on 8 September 2018, at 01:40.